The practices of the invited artists testify both for an intense research in and a sharp awareness of the conditions and context in which their work come into life, are exhibited, circulated, and archived. Furthermore, they engage actively and critically in sharing, coming together, disseminating these issues not only amongst their peers but also towards a wider audience. Because, as Ben Kinmont put it once, "There is also a need outside of here." 14:30 - 16h Book presentation, reading and discussion of a compiled reprint, created for this occasion, of Promised Relations: or, thoughts concerning a few artists’ contracts (1996), Materialization of Life into alternative economies (1996), and Project Series: Archive Contracts (2005) by Ben Kinmont. This reprint will be available for free during Bâtard Festival. 11h - 17:30h: Open Source Publishing has written a collaboration agreement to work with others. Within Caveat, OSP is rewriting this document and proposing a visual translation. 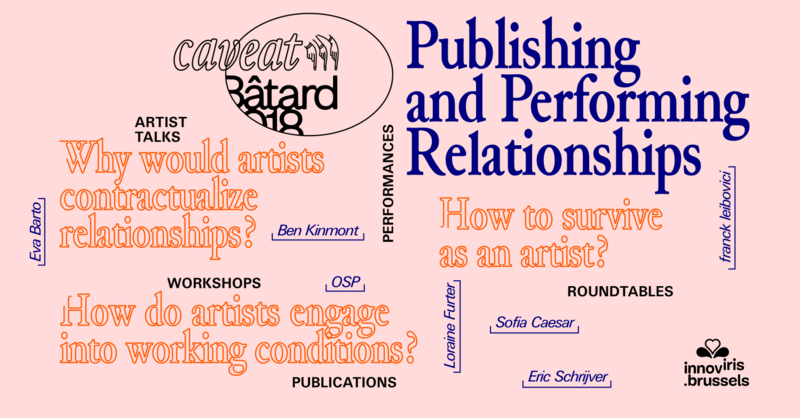 During Bâtard Festival, OSP invites artists and designers to contribute a description and interpretation of their own contract or conditions as to develop a language of practices. The conversations at Beursschouwburg will take place in a display module conceived by graphic designer and researcher Loraine Furter & artist Laurie Charles. The display is part of Speaking Volumes, a hybrid research project about feminist publishing practices, between art and activism — a blind spot in the history of artists’ books. The research takes different forms, from graphic documents to performative events, and materializes on a display inspired by Alison Knowles' artwork The Big Book, a giant structure with oversized pages she built in 1966. The Zero Hour relational object of Sofia Caesar will be installed on the stage for the whole duration of the festival. Eva Barto graduated from the School of Fine Arts (Paris, 2013) and attended the post-graduate program at Ensba (Lyon, 2014). Recent solo shows include La BF15 (Lyon, 2015), Primo Piano (Paris, 2015), gb agency (Paris, 2016), Villa Arson (Nice, 2016) and soon Kunstverein Freiburg (April 2019). Her work have been presented at Centre Pompidou (Paris, 2016), Biennale de Rennes (2016), Kadist (Paris, 2016), Van Gelder (Amsterdam, 2016), Marcelle Alix (Paris, 2015), Fondation d’Entreprise Ricard (Paris, 2017) Wattis Art Center (San Francisco, 2017) and Secession (Vienna, 2018). In 2016 she initiated the publishing project Buttonwood Press. Sofia Caesar makes videos, performances, sculptures, and installations. The body in motion is central to her work. She often engages herself and the public in seeing how the structures that act on us, such as architecture, language, or the camera, can be played with. In her works, we often see bodies escaping the forces that control them, creating a language of their own. In Caesar’s works, structures that surround her become scripts to be performed. An interview becomes a partition for a collective reading. An archival film is transformed into a trajectory on the floor. A work contract, a sign post that can be pointed at multiple directions. A surveillance system, a track for running. The sunset, a time to sit still. This exercise of creating choreographic scores with the world around her, allows Caesar to amplify moments of liberation. From structures that would otherwise be overpowering, Sofia finds dance and noise. She has participated in exhibitions such as 6th Moscow Biennial (RUS); Delirium & Destiny, A Tale of a Tub Rotterdam (NL); Transperformance 2, Oi Futuro (RJ, BR); EDP ​​Award, Instituto Tomie Othake (Sao Paulo, BR), among others. She won the Rumos Itaú Cultural 2018 prize and her work "Worker leaves the factory (conditions for the work)" is part of the permanent collection of Parco d'Arte Vivente, Torino (IT). Laurie Charles (b. 1987, Belgium, works and lives in Brussels) graduated from the School of Fine Arts in Bordeaux, France. She makes videos in which she invites her friends to play: there she mixes folklores, humanities and histories (and narratives of history). She writes and paints speculative narratives – fictions and on canvases. Besides other venues, her work has been exhibited at CIAP Kunstverein (BE), 1646 (NL), Nanjing International Art Festival (CN), Beursschouwburg (BE), Komplot (BE), and Le Commissariat (FR). Loraine Furter is a graphic designer and researcher based in Brussels. Specialized in hybrid publishing, she designs paper, web and digital publications. Her graphic design education allowed her to experiment with different forms of critical design, as well as other surrounding practices, such as editing and curating. Loraine Furter teaches at the Royal Academy of Arts and école de recherche graphique in Brussels, and she is part of the cyberfeminist collective Just for the record. franck leibovici (born 1975, lives and works in Paris) is a poet and artist. he's currently working with julien seroussi on the making of the international criminal court (the hague, the netherlands) through a series of exhibitions, publications and conferences, untitled "law intensity conflicts". OSP comprises a group of individuals from different background and practices: typography, graphic design, cartography, programming, mathematics, writing, performance. Through a collaborative practice, they work on workshops, commissioned or self-commissioned projects, searching to redefine their playground, digging for a more intimate relation with the tools. Eric Schrijver is a Dutch interaction designer, artist and author, born in Amsterdam in 1984. With performances and publishing projects in new and digital media, he uses the internet as a performative space. Eric directs a group blog called I like tight pants and mathematics, that aims to motivate designers and artists to get more involved in the world of computer programmers. From 2011 to 2017 Eric was a core member of the graphic design collective Open Source Publishing. A former faculty member at KABK (NL) and ERG (BE), he has taught workshops around the world. Caveat is a research project convened by the Brussels-based artists’ initiative Jubilee, in partnership with Open Source Publishing (OSP, design collective), No New Enemies (operating Harlan Levey Projects and Penthouse Art Residency), and Eté 78 (a collector's art space). It is a collective research project reflecting and acting on the ecology of artistic practice. The project title alludes to the legal principle caveat emptor (buyer beware) – signalling the research's ambition to raise awareness and co-create alternatives. Caveat tries to find more sustainable, balanced ways of operating within the existing legal frameworks. When the limits of the existing system are reached, it tries to come up with possible new narratives that open up space for reflection.